Having reviewed both smartphones for the past weeks, I would like to share my opinions between these 2 flagship devices. One is the top-of-the-range smartphone, and the finest Android device to beat (review). The other is the thinnest optical zoom smartphone that puts photographic power in your pocket (review). Samsung Galaxy S7 edge is a beauty to behold. It’s slim and lightweight, yet packed with so much features. I would handle the device carefully and not let it drop, not even once. There are too much exposure on the glasses, and the aluminium frame will easily inflict dents. The ASUS Zenfone Zoom is comparatively more handful, but has a solid build that looks like it can withstand a few dings. The rear casing is made of real leather and the aluminium sides feels cool to the touch. 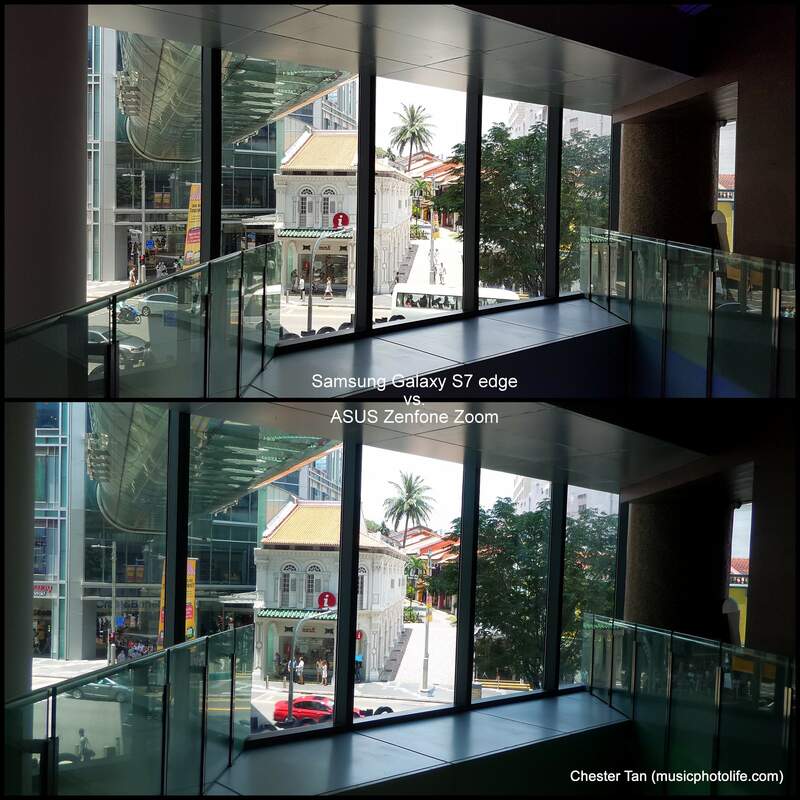 The S7 edge matches or beats the Zenfone Zoom in all aspects of the hardware. The latter betters the S7 edge in 2 features: built in 64GB storage and 3x optical zoom camera lens. And if you want to consider price as the third feature: the Zoom is almost half the price of the S7 edge. 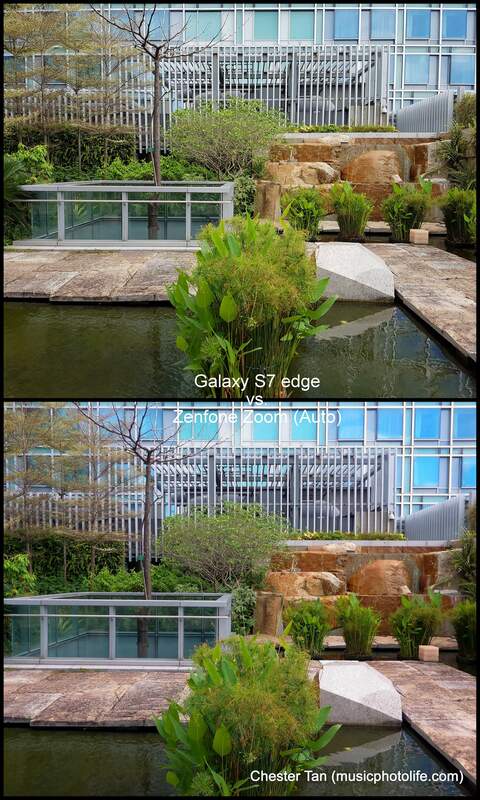 For detailed specs, read my separate reviews on the Samsung Galaxy S7 edge and ASUS Zenfone Zoom ZX551ML. S7 edge produces better images that are ready for online sharing. They are sharper, has better exposure, captures more dynamic range. It shoots faster, less shutter lag. It favours daylight tones so images turn out warm. 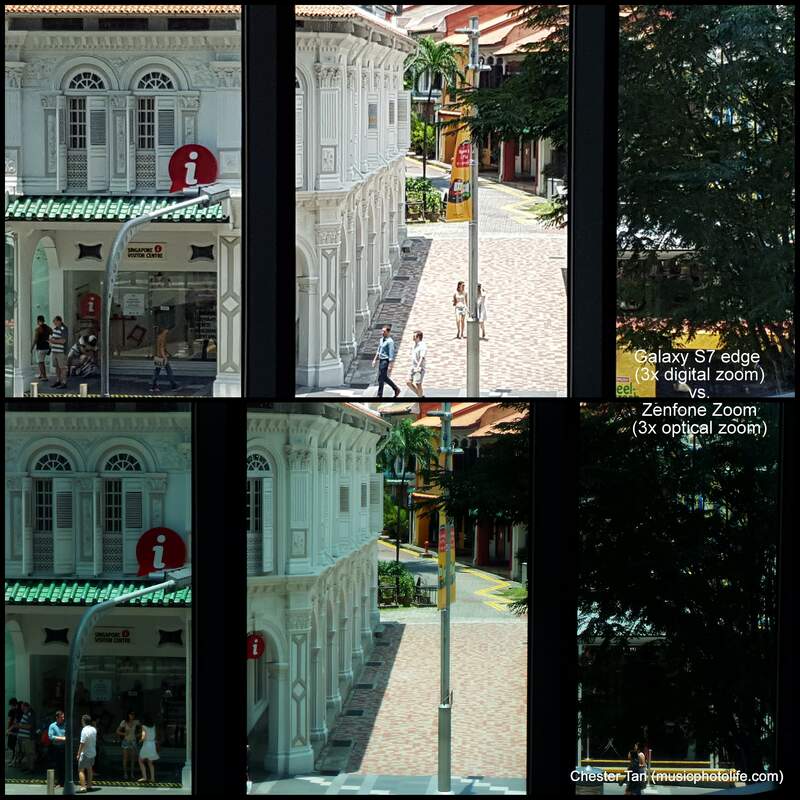 Zenfone Zoom captures images slightly slower, but its greatest advantage is optical zoom. Digital zoom may be fine for online sharing but not great for archival. 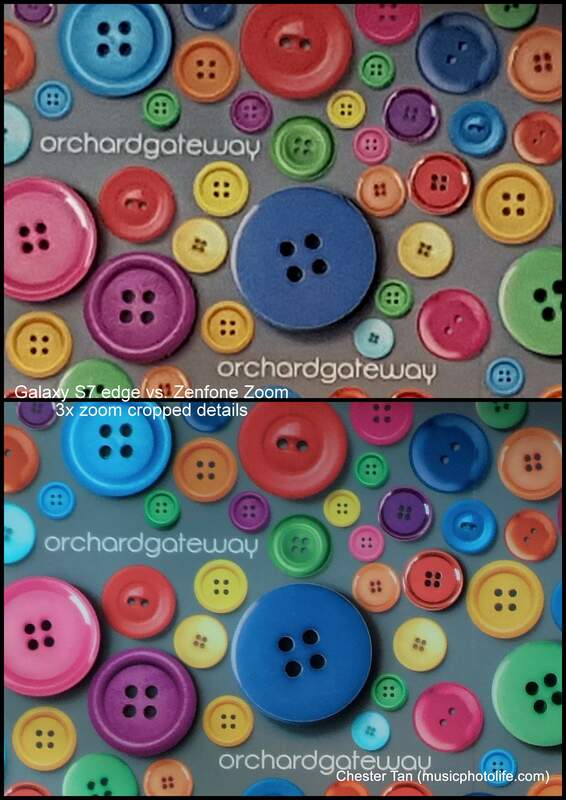 If you often find a need to compose shots tighter, the Zoom will achieve better image details. 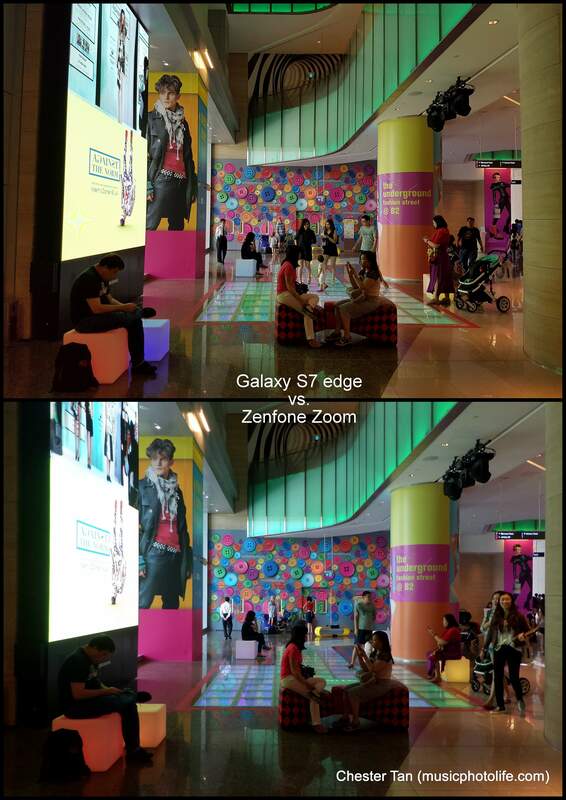 The Zenfone Zoom does capture images with great quality, but it may require tweaking of the shoot settings. Shooting with HDR mode improves dynamic range, but requires longer time to capture and save. Zoom action might feel laggy if you needed it to zoom faster to catch the fleeting moment. If you want to take a quick snapshot, the S7 edge focuses faster and captures faster with its larger-aperture lens, and processes with wider dynamic range thanks to Auto-HDR. 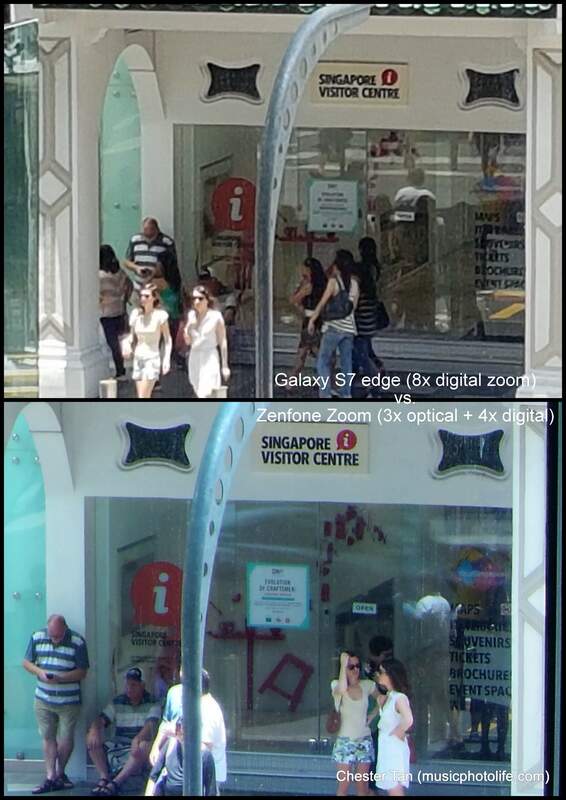 The Zenfone Zoom does not focus that instinctively, and it takes a steady hand to take sharp images. For users who understand the value of optical zoom, the minor inconvenience have to be overlooked. 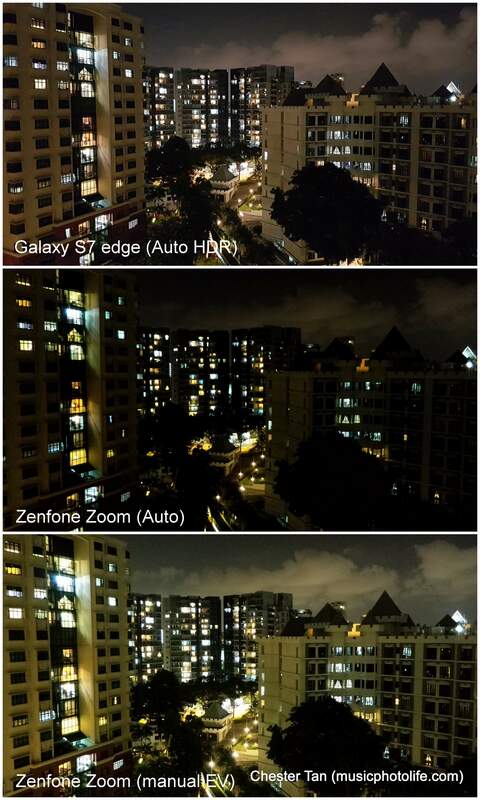 For night shots, Samsung captures the scene with good brightness in Auto mode. 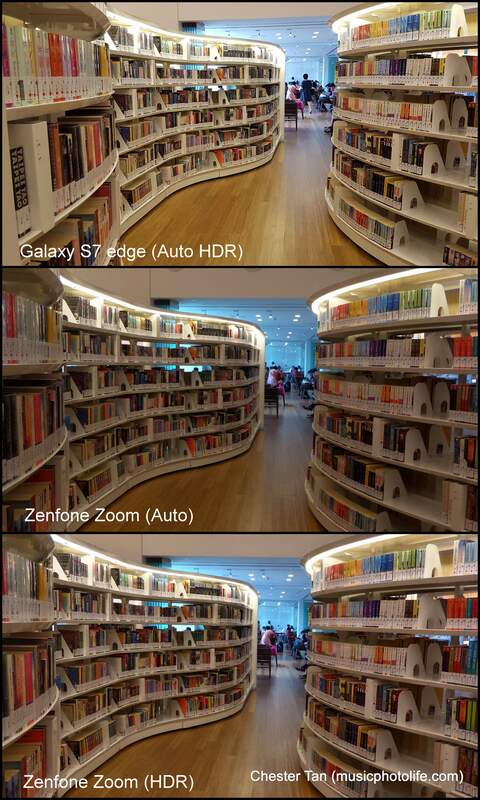 ASUS needs to manually boost the exposure to achieve similar outcome. Winner: Samsung for speed and brilliance. ASUS for optical zoom. 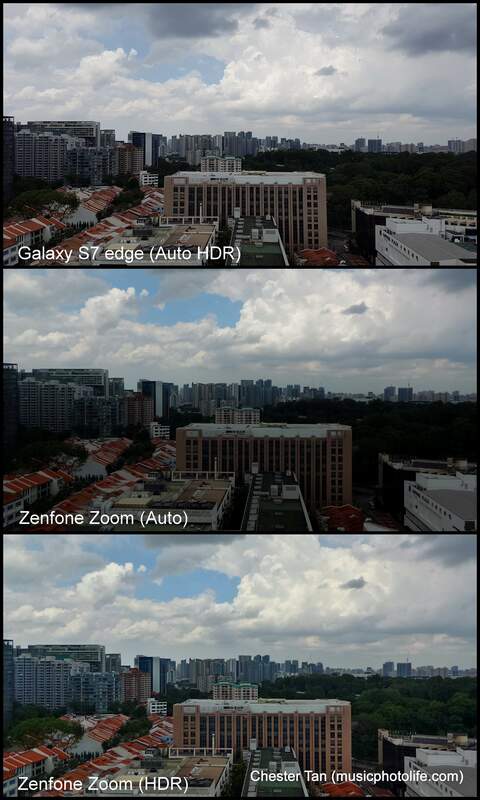 Samsung Galaxy S7 edge easily wins the Zenfone Zoom as a smartphone, but for S$1098, it ought to. The ASUS Zenfone Zoom is priced a mere S$659 (the 128GB variant sells for S$729), but the hardware specs are comparable to the S7 edge: 4GB RAM, runs on 2.5GHz quad-core Intel processor, full HD 5.5-inch screen, NFC, ZenUI with preloaded apps to kickstart your Android experience. It has larger internal memory (64GB/128GB) and also supports external microSD storage. And the biggest advantage is its ability to achieve optical zoom which is practically unbeatable by any smartphone in the market. If you have any thoughts and questions, let me know under the comments section. Follow my Instagram for regular photo postings taken by the review devices I have on hand. 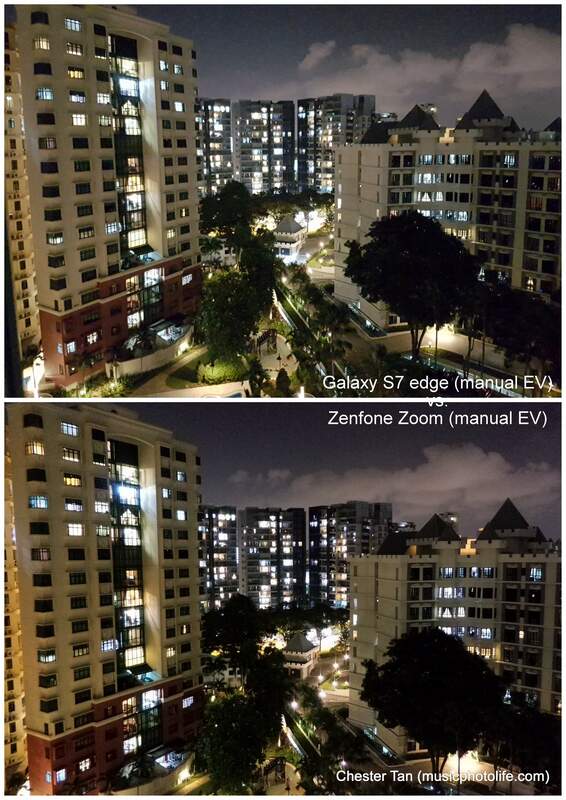 The Samsung Galaxy S7 edge beats the ASUS Zenfone Zoom in every way, except optical zoom quality and price-value. 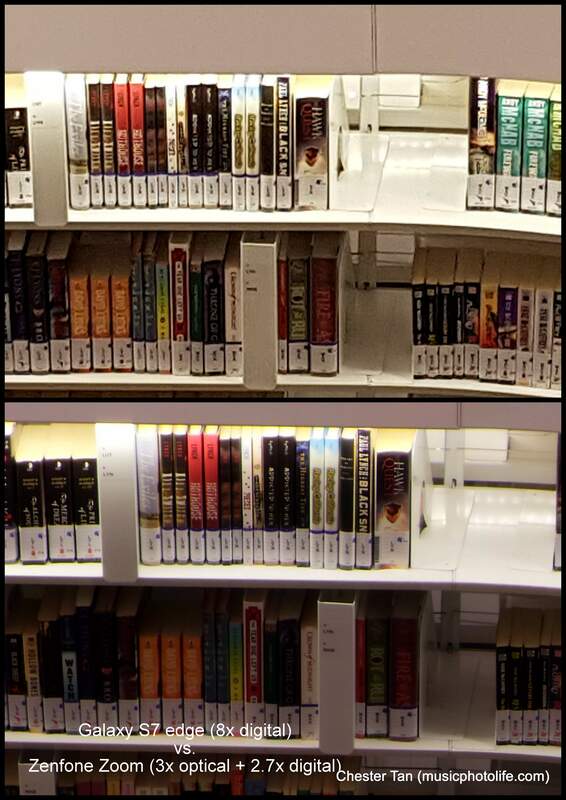 Read on for photo comparison. Wah your review damn power sia 🙂 Top marks for effort!